The VonShef Fondue Set is the perfect centerpiece to your next dinner party. Recreate the rustic alpine ambiance and flavors in the comfort of your own home! Although fondue is traditionally a communal pot of melted cheese which bread is dipped into, over the years there have been modernization to the concept too. You can even indulge your sweet tooth by dipping fruit into a pot of melted chocolate! Our Fondue comes with 6 long stemmed fondue forks for dipping and cooking your choice of foods; each with different colored tips so your guests can easily identify their fork in the pot. The burner is suitable for use with both methylated spirits or solid fondue gel, features an adjustable flame and snuffer to maximize safety. 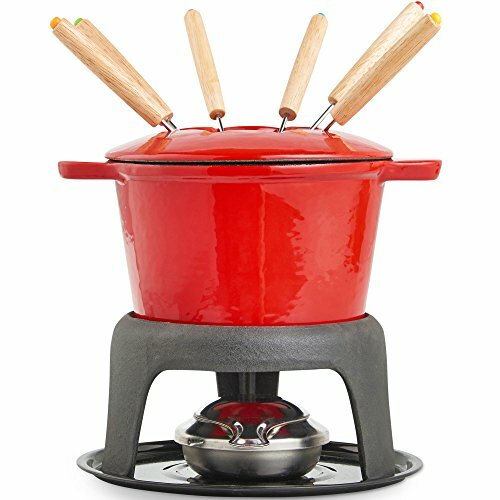 The set is made from durable and sturdy cast iron, and the Fondue pot itself is also enameled which makes cleaning extremely easy. The pot also features a splash protector ring to guard from injury while you cook. Cheese Fondue: The classic Alpine dish. Best results are achieved by combining two Alpine cheeses such as Swiss, Gruyere, or Fontina, and mixing with a little acidic liquid to break up the natural "Stringiness" such as a dry white wine or lemon Juice, and a thickener like flour or cornstarch. Experiment with different combinations to see what works best for you. INC 6 COLOR CODED LONG STEMMED FORKS - For dipping and cooking, making it easy to use and know which is yours!